The Crawford ballads are one of the surviving sections of the Bibliotheca Lindesiana, the family library which was principally the result of the endeavours of Alexander William Lindsay, 25th Earl of Crawford and 8th Earl of Balcarres (1812–1880) and his son James Ludovic Lindsay, 26th Earl of Crawford and 9th Earl of Balcarres (1847–1913). The contents of this vast library, and the story of how it was assembled and then in large part dispersed, form the subject of Nicolas Barker's Roxburghe Club publication Bibliotheca Lindesiana (London, 1977; corrected reprint 1978). Following Barker, the 26th Earl is here referred to as Ludovic. In the 1940s, following the death of David, 27th Earl of Crawford and 10th Earl of Balcarres, a substantial portion of this library was sold and Haigh Hall, which had housed it, was given to the Borough of Wigan. 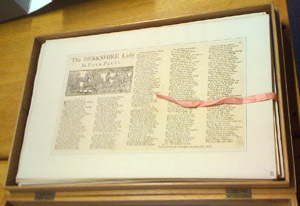 Significant among the portion that was retained by the family were eleven ‘special collections’ (totalling over 50,000 items) which are now on deposit – they are the property of the Balcarres Heritage Trust – in the National Library of Scotland (for details see the online Special and Named Printed Collections directory). One of these special collections is the English Ballads Collection, NLS shelfmark Crawford.EB., numbering nearly 4,000 items. The first section of this collection, Crawford.EB.1–1466, was described in Bibliotheca Lindesiana. Catalogue of a Collection of English Ballads of the XVIIth and XVIIIth Centuries Printed for the most part in Black Letter (Privately printed, 1890; reprinted New York, 1968, in 2 vols). There were no further large-scale acquisitions of early ballads after 1890, but Ludovic added some more nineteenth-century ballads to those he already had (in his 1890 preface he writes that he has ‘upwards of 2000’ of those) and a few earlier ballads, of which 13 are included on this site (Crawford.EB.1713, 2336, 2385, 2514, 2752, 3015, 3537, 3538, 3542, 3814, 3841, 3842, and 3851). The later ballads now shelf-marked Crawford.EB.1466-3888 have been digitised by the National Library of Scotland and made available through its Digital Gallery. It has grown from modest size to considerable volume. I bought a few at first as typographical curiosities, and to illustrate the woodcut ideas of the times; but I soon desired to acquire more. I found an opportunity, and bought of Mr. Ellis the three volumes which had at one time belonged to Mr. Ouvry, late President of the Society of Antiquaries, – a collection which, I believe, had originally been formed by Mr. J. Payne Collier. This interesting series had been catalogued by Mr. T.W. Newton in the year 1877, when a few copies were printed off for private distribution. To these three volumes I gradually added five others, or some five or six hundred additional pieces of varied interest. But by far the most valuable acquisition I have been able to make was the purchase, in 1885, of lots 139, 140, and 141 of the Jersey sale. The collection, as it came into my hands, consisted of 787 ballads, having but a few duplicates among them. About 60 of these I placed in the British Museum, on learning that they were greatly wished for there; the remainder were incorporated with my own. Since that date only one collection of any importance has come into the market, and that I was fortunate enough to secure from the Messrs. Sotheran. The Crawford Papers, also on deposit in the National Library of Scotland (shelfmark: Acc.9769), include a Library Papers section with chronological sequences of Library letters, Library invoices and Library receipts. From these we learn that the Ouvry ballads were acquired in 1882; the Osterley Park (Earl of Jersey) sale was in 1885, and from the third volume (lot 141) Ludovic generously presented 68 ballads to the British Museum, now the British Library (Joseph Woodfall Ebsworth, who co-edited a modernized edition of the Roxburghe Ballads, advised the British Museum on those it should take). In due course further research in the Library Papers will provide more details about the history of Ludovic’s ballad collecting. Up to the time of the Jersey purchase I had bound the ballads in volumes, but I always felt the inconvenience of this practice, as it was not possible to insert or withdraw a sheet. I therefore broke up the whole of the bound volumes, 15 in number, and re-arranged the whole, on separate sheets, in the order of their first lines. Each ballad is mounted on stout paper of uniform size, with a simple black line drawn round the sides; any notes or remarks are written on the margins, and the whole are kept in cardboard boxes. The natural meaning of ‘I had bound the ballads in volumes’ is that these were volumes he had made up himself and not volumes as he had acquired them, and the implication of saying that ‘it was not possible to insert or withdraw a sheet’ is also that the volumes contained ballads in an order determined by himself. The further implication of saying that after breaking up the 15 volumes he then ‘re-arranged the whole’ is that his own initial arrangement was not in the order of the ballads’ first lines. From this, and from what follows, it is clear that Ludovic put considerable thought, time and effort into curating his ballad collection. In all cases where I have been able to learn of other copies of a ballad, I have noted the fact at the end of the entry. For convenience, I have done this in the form of an abbreviation and a vulgar fraction. This indicates the collection, the volume, and the number in the volume. It must not, however, be taken to mean that where there are several copies of a ballad known all are duplicates, even though they are by the same printer. It is the rarest thing to find a genuine duplicate, i.e., one in the sense of the bibliomaniac. It would seem that very few copies of any sheet were pulled at the same time, and that, if the supply was not up to the demand, the type was set up again for a new issue. The references to other copies on the margins of the sheets have all been included, as far as it is possible to judge from sampling, in the 1890 catalogue, though there is at least one example, 430, where the references (to Roxburghe and Euing collections) in the 1890 catalogue are not on the corresponding sheet. The shelfmarks near the top right-hand corner of the sheet in the form Crawford.EB.xxxx were added by NLS staff in 2012 prior to the digitisation. They correspond to the numbers in the 1890 catalogue, and therefore where there are two ballads on a sheet, there are two shelfmarks written there; where a ballad covers more than a single sheet, each sheet is shelfmarked Crawford.EB.xxxx(1), (2), etc. One consequence of Ludovic’s re-arrangement of his ballads is that – with one exception – their earlier provenances cannot be traced easily, if at all, especially as none of the collections he acquired seems to have previously been listed in detail. The exception is Frederic Ouvry’s collection, which was described in T.W. Newton, Catalogue of Old Ballads in the Possession of Frederic Ouvry, Esq. (London: Privately printed, 1877). Newton’s catalogue gives volume and page numbers for the individual ballads (meaning that we can study Ouvry’s arrangement too) as well as assigning a running number to each. Because Ouvry’s ballads were acquired by Ludovic, Newton’s numbers are not among the references to ‘other copies’ given in the 1890 catalogue. However, from their first lines, most of the Ouvry ballads can be traced in the 1890 catalogue, and the identification can be confirmed both by the Ouvry running numbers that Ludovic wrote on the mount immediately above the top left-hand corner of the ballad and by the stamped numbers (and the same – presumably earlier – handwritten numbers slightly below and to the left of the stamped numbers) at the top right-hand corner of each mount: these refer to the page number references given in the Ouvry catalogue (Ouvry had his collection in three volumes, but Ludovic did not include the volume number). A few items in Ouvry’s collection were not included in the 1890 catalogue: some ballads which presumably did not meet the criteria Ludovic applied (these are now in the second part of the collection); two prose pieces which Ludovic transferred to his English Broadsides Collection (now the Crawford Miscellaneous Broadsides Collection, also on deposit in the NLS); and one fragmentary ballad and one manuscript item which cannot be traced in any surviving part of the Bibliotheca Lindesiana. The details can be found in my assembled Ouvry-Crawford Concordance.